For the boxer, see Bert Lytell (boxer). 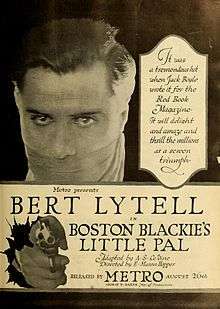 Bert Lytell (February 24, 1885 in New York City - September 28, 1954 in New York City), Born Bertram Lytell, he was a popular screen star of the silent film era who starred in romantic, melodrama and adventure films. On stage he was with Marie Dressler in her 1914 Broadway play, A MIX-UP. He also had success in vaudeville in the 1920s with the one-act play The Valiant. Like many other silent screen stars, Lytell's career collapsed after the advent of talking pictures. Lytell was married to the popular silent film actress Claire Windsor from 1924 to 1927. His younger brother Wilfred Lytell (1891–1954) was a popular stage and screen actor. Lytell was President (Shepherd) of the famed actors club The Lambs from 1947-1952 and is listed as an Immortal Lambs. Lytell has a star at 6417 Hollywood Avenue in the Motion Picture section of the Hollywood Walk of Fame. ↑ "Bert Lytell". Hollywood Walk of Fame. Retrieved 19 July 2016. Wikimedia Commons has media related to Bert Lytell.